Anyone who has sat through a first semester chemistry class could tell you (or at least should be able to tell you) that neon is in the noble gas family. These elements are on the far right hand side of the periodic table, as you look it, and they are so named because…OK... enough with the boring science lecture. Tell us how they came about you say? Neon signs came into existence at about the same time other types of artificial light were being invented. Electricity caused a revolution in home and business power capabilities, but it was also a boon to light. Imagine sitting around the family fire, or a natural gas lamp, or a bulbous Victorian whale oil construction trying to read after dark or do homework. Light was at a premium then, as it is now, and people could scarcely mimic the power of the sun. Most people went to bed early because there was so little light after dark. Electricity changed all of that. About the same time that he found he could produce and transport electricity, Thomas Edison also found that the filament required to produce a reliable electric light. At about the same time Nikola Tesla, Edison's arch rival, bent glass tubes into shapes for the 1893 Worlds Fair to demonstrate that gas trapped in a pressurized tube would glow. It could be argued that these where the first neon signs. Tesla's invention of a high voltage transformer would ultimately be needed to power neon signs. Neon was not the first thought as there are much more easily obtained noble gasses around (neon is actually a very rare element, comparatively), but a Frenchman named Georges Claude decided to experiment and he saw that this little known, colorless, odorless gas would produce a bright, sustainable light. He was able to purify the rare element. 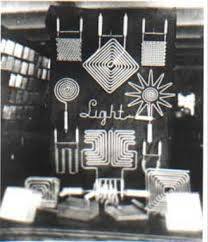 He then formed a company, produced neon designs with his glass tubes, and the rest is neon sign history. Thanks to Thomas Edison, Nikola Tesla and Georges Claude, neon lights are now a fixture especially in the advertising community. How do they get the different colors and what other uses can neon be put to? Well, that is a story for another day.